I’m a bit of a wuss when it comes to horror films. I scare easily and tend to avoid any torture-heavy films because I find them too difficult to sit through, plus I’m rather squeamish when it comes to any nasty violence or gore. Over the years I’ve hardened up a little (thanks to Justin’s video collection and trips to several horror festivals) but there are still a handful of notoriously nasty films that I’ve been consciously avoiding (Martyrs and A Serbian Film to name a few) and I occasionally feel like I’m getting a minor panic attack when I’m trapped in a cinema about to watch something grim. When I was a teenager though I found myself drawn to a couple of the goriest films the genre had to offer, namely the Evil Dead movies and the early films of Peter Jackson, Bad Taste and Braindead (a.k.a. Dead Alive). As timid as I was (and still am), I discovered that when presented with humour and energy, gore was good. Flash forward a decade or so to 2008 and I was enjoying my second (or third?) Dead by Dawn film festival up in Edinburgh (horror fans in the UK should check it out if they haven’t already). Early in the listing for the weekend was a film called Machine Girl. Reading up on the film in the programme it sounded pretty messed up and I could hear alarm bells ringing in my head as the lights dimmed. 96 minutes later I was raving about the film to anyone who would listen though. Its over the top nature and total disregard for logic or realism made the fountains of blood all part of the fun, bringing back those loving memories of watching Braindead on VHS in the mid-nineties. This was my first introduction to the work of Noboru Iguchi and the new wave of Japanese splatter movies which took the nation’s reputation for controversial, graphic filmmaking and stripped it of any traces of class, artistry and reverence. Over time I’ve watched quite a few of the titles from Iguchi and similarly inclined directors such as Yoshihiro Nishimura (who provided special effects makeup for Machine Girl as well as directing films such as Tokyo Gore Police and Vampire Girl vs. Frankenstein Girl) and I must say, I’ve been gradually growing a little tired of them. The last couple I watched, Helldriver and Yakuza Weapon, had their moments but on the whole didn’t work as effectively as Machine Girl and Vampire Girl vs. Frankenstein Girl had when I was introduced to the sub-genre. Nevertheless, when I was offered the chance to review Iguchi’s latest blood-drenched opus, Dead Sushi I had to say yes. Dead Sushi, if you haven’t already guessed, is about killer sushi. Keiko (Rina Takeda) is a wannabe sushi chef who is told she will never make it by her harsh but talented sushi master father. Keiko can’t face him anymore so runs away from home, finding work as a waitress at an inn run by a dodgy couple that show little respect for their staff or the sushi they claim to specialise in serving. When the management of a large corporation come to stay, a series of ridiculous incidents occur which result in the sushi created in the inn coming alive and seeking vengeance on the disrespectful residents and staff. Because the art of making sushi is similar to the art of martial combat (of course!) Keiko is the only one that can stop the wave of rice packed terror coming their way. If you’ve seen any of the other films I mentioned earlier you’ll know what to expect. Dead Sushi is cheaply shot, hammily/ropily performed and filled with base humour and cheap gags. The special effects are pretty laughable and any opportunity to squeeze in some gore, violence or titillation is exploited whenever possible. But this is all part of the fun. If this doesn’t appeal to you, don’t even consider picking up the box as you won’t like what you see. So, I’ve probably not sold it very well so far. How films like this succeed is by not giving a crap about what happens and what they throw in there. You’ve got a singing egg roll sushi creature that befriends our heroine, a man who gets reborn as a giant tuna, sushi nunchaku and a giant sushi-roll battleship. The warped imagination which goes into these films is what makes me happy to look through the daft and occasionally shoddy surface. Thankfully, Dead Sushi improves on some of the flaws I found with Helldriver (and a couple of the other titles), which had some tremendously imaginative and fun scenes but was overwrought and got repetitive and dull by the end. Dead Sushi, as well as being a lot shorter at a lean 87 mins (92 mins on IMDB, so it might have been cut), is more tightly paced and varied through its running time. It’s an easy watch for those with the stomach for it, whizzing by without giving you chance to question what the hell is going on or why you should care. The action scenes were better than I expected too. These types of film usually have action in them, but it generally plays second fiddle to the blood and guts. Here, Iguchi casts karate black belt Rina Takeda in the lead role and makes the most of her skills in several fairly complicated action scenes. It’s hardly Sammo Hung/Jackie Chan/Donnie Yen level choreography and the fights aren’t shot particularly well, but they’re not bad and I found myself enjoying the fight scenes more than the ‘splattery’ ones. As much as I enjoyed myself, there did feel to be something lacking though. There still wasn’t the spark I felt with the first couple of Japanese splatter films I watched. 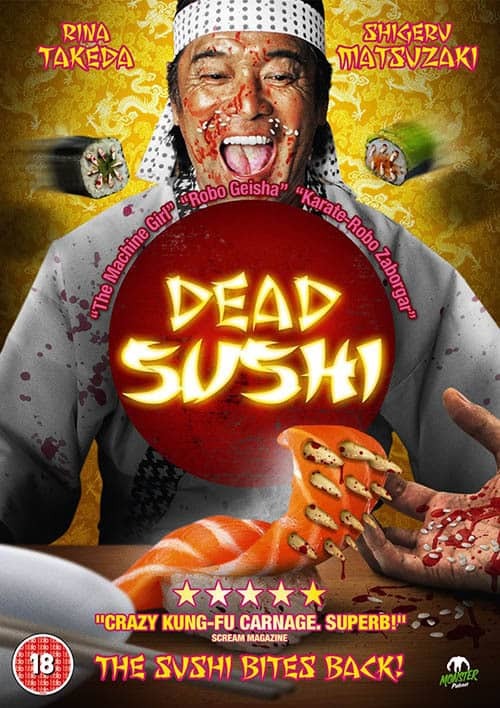 Dead Sushi, although having the food aspect adding to the gross-out factor, isn’t nearly as gory as many of the other titles, which may be part of it. 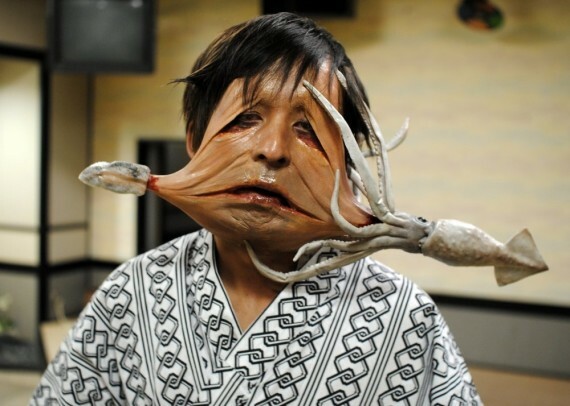 In general it’s lighter in tone too, although I still wouldn’t recommend this to those of a nervous disposition. Maybe it’s just that the initial novelty value has worn off or maybe it’s because I watched this at home on my own rather than in a festival or with friends. Either way, this didn’t blow me away, but I can’t deny that I enjoyed myself and the 87 minutes flew by with enough blood soaked insanity to spray a big red smile on my face. Dead Sushi is out on 23rd September in the UK on DVD and Blu-Ray, released by Monster Pictures. I watched the DVD and the picture and sound quality was decent. There are a handful of special features too. There’s a 10 minute world premiere stage greeting which contains a short but quite impressive martial arts demonstration from Rina Takeda. An 11 minute ‘Making Of’ is ok, but rather bare bones. A 2 and a half minute interview with Takeda and Noboru Iguchi gives some more information about the latter’s inspiration behind the film (Attack of the Killer Tomatoes was one, unsurprisingly). And finally, as well as a few trailers, you get an ‘Extreme Sushi Eating Competition’ from another festival screening. This is fun if you’re into the Man Vs. Food or Jackass kind of food challenges, but the duck foetus egg was a bit much for me to watch being eaten.